Major WordPress version updates come a few times a year, and we now have version 4.8, named after Jazz Pianist Bill Evans. We call it the Widget edition. wait? Does that sound a little foreign to you? It should. Because with the Theme Universe exploding, and responsive design (that resizes to any device size) widgets have become the way to put things anywhere on your site- from the front page to the sidebar, to the footer etc. Other than stock widgets, many widgets are installed by Plugins, and some by themes and theme builders. And of course, with the customizer as the WordPress answer to SquareSpace, Wix and whatever other WYSIWG proprietary website solution- you can now do a drag and drop element in your site. Google Maps Widget that’s going places. Button Widget that you’ll love to click. Image Widget that’ll let you add images everywhere. Call To Action Widget that’ll get your users performing the actions you want. Slider Widget that slides images and HTML5 videos. Price Table Widget that’ll help you sell more. Post Carousel Widget that displays your posts as a carousel. Features Widget that lets you display a set of site or service features. Video Widget to get your videos out there. Headline Widget to get you noticed. Social Links Widget to show you’re active. The beauty of WordPress is that there is a complete selection of vetted tools on WordPress.org to extend and expand the capabilities of your site. Come to our next Websitetogy Seminar and learn about widgets, plugins, best posting practices and a whole bunch more. Thinking of jumping in on buying online ads? Or letting advertisers put their ads on your site? Think online advertising is cheaper than “traditional media” like TV, newspapers, billboards and direct mail? Now, as more and more brands find their ads popping up next to toxic content like fake news sites or offensive YouTubevideos, JPMorgan has limited its display ads to about 5,000 websites it has preapproved, said Kristin Lemkau, the bank’s chief marketing officer. Surprisingly, the company is seeing little change in the cost of impressions or the visibility of its ads on the internet, she said. An impression is generally counted each time an ad is shown. Sure, keeping your ads off objectionable sites is a noble reason for refining the sites where your ad appears, but the reality is, having your ad appear on a clickbait site is unlikely to get you a conversion (sale). If it wasn’t profitable to build clickbait sites to just serve up ads, they wouldn’t exist. If that’s what you want to do, we can show you how to be the scum of the earth, better in our seminar. Think about the ads you see online- and how many you interact with (assuming you aren’t part of the 30% of internet users who have enabled adblocking in your browser). If you are like a lot of people, it takes a whole lot to make you click. How many people do you know who say I’m going online to look at ads? And here is a Cannes Award winning campaign for Geico that you can’t stop watching, but, it may or may not get you to buy car insurance from them. The thing both these spots get right- is realizing you don’t really want to watch a pre-roll commercial, so they’ve made it interesting. It’s not a TV spot- it’s a youtube spot- built for the platform and working hard to not be intrusive. As to all the other ads websites, most you can ignore. Easily. Even in your Facebook feed, how often do you click on an ad? Here are some tips to make sure you have a better chance on conversion. Remarketing to people who’ve been on your site already is usually a better bet. You know these ads well- you’ve gone to look at something at Amazon- and may have even purchased it, but it keeps showing up on your feed forever. Hint: better bet is to show ads of how to use “it” or accessories for “it” than to keep hammering the ad of “it”- unless you are offering a discount (which may tick your customers off if they bought it for more on your site already- so have a price guarantee). The basic rule of sales applies- people do business with people they know- so these ads tend to preform well. Advertise to people who know someone who is your happy customer. While it’s hard to get people to post “Hey, I just bought “it” at your store, without a potential reward, it can happen. More likely, is advertising to people who are similar to people you’ve already sold to. Facebook allows you to upload a customer list and they will find people who are friends of the people who have bought from you in the past. Advertise to people who are like the people you’ve sold to. This is also a Facebook option, using their software you can match demographics and geography and other factors to your customer list and advertise to people who are more likely to buy from you. And maybe the least intuitive ad- isn’t an ad at all. Create informational videos, instructional videos, or reviews and target people by their interests. Think about your research before buying- do you look for reviews? Watch comparison video’s, unboxing, assembly? This kind of content can solve a buyers questions- and possibly drive them to buy more than an ad. Target the ads carefully, because ideally, these types of posts should work organically, without a ton of ad dollars. 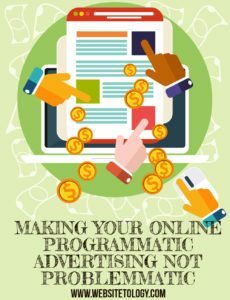 For most advertisers dipping into “programmatic” the numbers sound amazing that are offered by programmatic networks, what’s amazing is the verification of actual display of ads is self reported, not audited like conventional media for distribution, insertion, reach and frequency. It’s the wild west of advertising accountability out there, which means it’s really up to you to figure out how to track your ad spend for effectiveness. There are all kinds of ways to do this, that add a level of complexity, but can also help you refine and improve your ad buys. We explain some of these tools in our Websitetology seminar, but if you have further questions, you can always call and talk to us about how to most effectively guarantee that your programmatic isn’t problemmatic. Back in January of 2012 we posted one of our most popular tutorials- how to make a JPG preview of a PDF document uploaded to your WordPress site. It was a multi-step process. It was a pain. 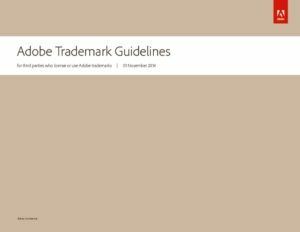 Adobe Trademark Guidelines PDF 2014, click to download. There were plenty of reasons to upload a PDF- but, all WordPress would provide was a link. People want to see what they are clicking on to download. There are many reasons why you would want to do this. First and foremost, uploading PDFs using the basic WordPress uploader just provides a link to the document- without a way for your user to see what the PDF looks like. The reason you are using PDF’s instead of a JPG is because PDFs, if created properly, are search engine friendly and handicap accessible. To make a PDF properly, it’s not made from a scan- it’s made from an document-so that you can highlight and copy text from the PDF. If you are making a PDF from a scan, make sure you use the “recognize text” function to perform Optical Character Recognition on your scan. It won’t be perfect, but it will be close.JPG’s are not search engine friendly, whereas PDFs are. Since WordPress 4.7 or so, the media library will show a preview of a pdf you upload, but it still only places a link. Lucky for us, Mizuho Ogino made a free plugin for WordPress which allows you to post a preview of a PDF without going through a bunch of steps. Just download, install and activate PDF Image Generator from the WordPress Plugin Repository and bam! Instant previews of every new PDF you upload. One thing, even though the library interface gives you the ability to specify justification, it doesn’t work. After the PDF image is in your editor window- click on the image and get the edit option- and pick your preference. The above Guidelines is right justified. Note, your server must have ImageMagick and GhostScript installed or it won’t work (ask your hosting company- or host with us- www.nextwavehosting.net). We’ve found this plugin to be invaluable, especially handy for manufacturers, news sites or government organizations that need to post a lot of PDF documents to share.